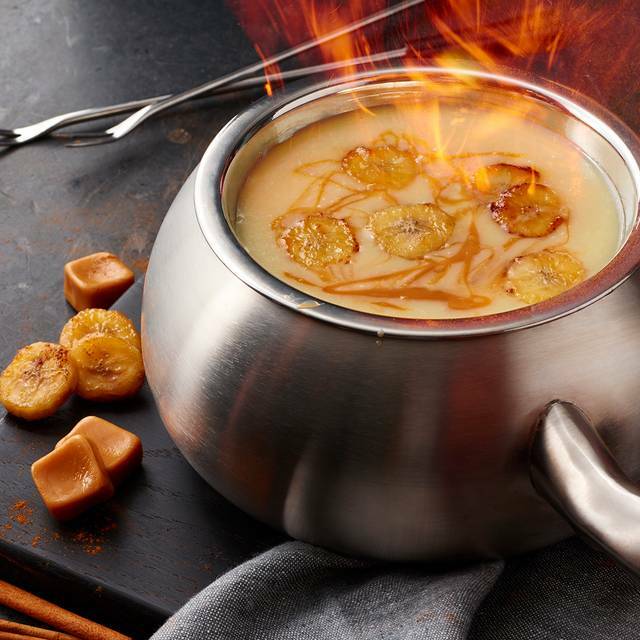 You must make reservations at least 5 minutes in advance of the time at The Melting Pot - Kansas City. The Melting Pot offers complimentary covered parking in the public garage above the restaurant. Enter off Pennsylvania next to Hogs Head. We are open for mothers day. Please call the restaurant for reservations and further information. 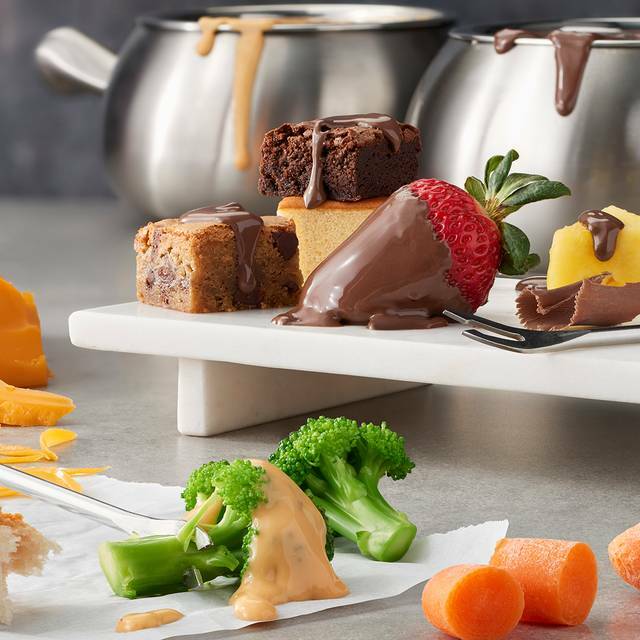 At The Melting Pot, fun is cooked up fondue style, creating an out of the ordinary dining experience. You'll discover all the ingredients for a perfect evening, including attentive service, private tables, & an atmosphere of casual elegance. 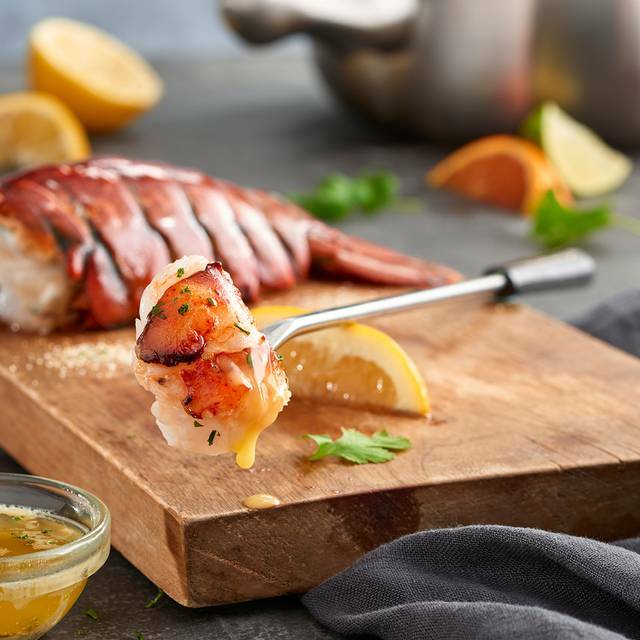 In addition to the cheese & chocolate fondues which have made The Melting Pot famous, they offer a fine selection of beef, chicken, seafood, & vegetarian entrees, as well as an exceptional wine list & a full bar. 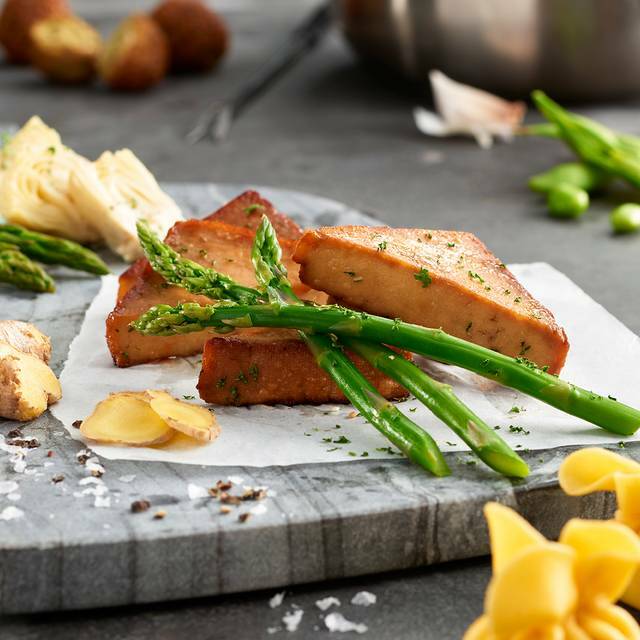 You may enjoy a romantic evening for two, a special occasion with fifty of your closest friends, a dining experience to impress your boss, or a night out with the family. 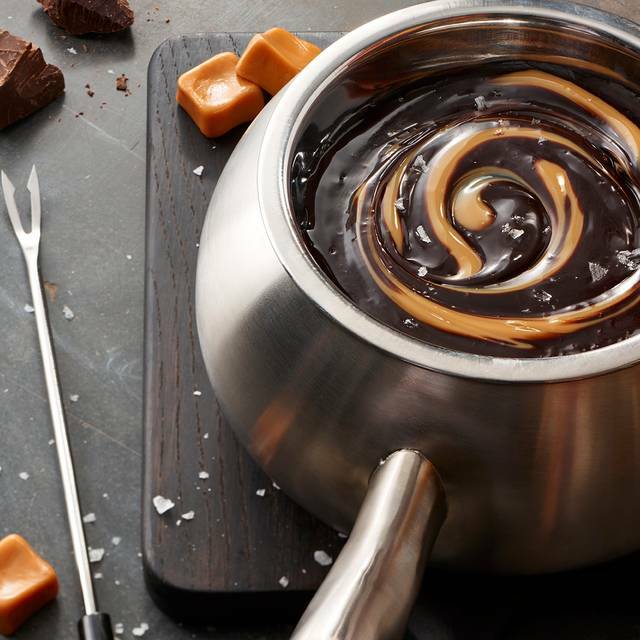 Whatever the occasion, an evening at The Melting Pot is always a celebration. Call directly to inquire about the Romance Packages in The Melting Pot’s private celebration booths for two. Our first time, and was a really fun experience. Cheese fondue was definitely our favorite of all 4 courses. Loved it. It was our first time so a little more instruction would have been good but overall we had a blast. There were 4 other couples around us and no one was happy with the slow service. We we're the only couples in the whole place . My water glass was empty for most of our meal. They brought out our chocolate before we had salad. Our first Andy definitely our last time at the melting pot. Made reservations for a date night and ordered the Touch of Romance package and requested a private booth. Arrived 5 minutes before our reservation and checked in. Twenty minutes later, and after watching others in the waiting area get seated, we were taken to a normal booth. Touch of Romance was supposed to include rose petals on the table and champagne. Not only was that missing, the table itself had not even been wiped down. I understand the private booth was a request and not necessarily guaranteed but I do not believe any effort or consideration was given to honor that request. As I was getting ready to ask the young lady about it she immediately turned and walked away. Ok, fine. As long as I didn't get charged for the Romance package, so be it. The area we were seated in felt like a sauna. Like being the middle of summer without a/c but it was about mid 50's outside. Super loud environment surrounded by some kind of teenage girl's birthday party. Server was very young lady who was more interested in telling us about how exhausted she was from her last table which was a large party. Ordered a bottle of wine and was maybe a degree colder than room temperature. Cheese fondue was ok but the stickers were misreable. The baby carrots looked like the crap you throw away at the bottom of the bag. Half the apples were cut so small you couldn't even get them on the fork. It really turned into a race to see how quick we could eat and get the hell out of there. Never going back. We were seated in a portion of the restaurant that had very little ventilation. It was probably about 88 degrees with 89% humidity. Our server couldn’t have been older than 17 and when he served the wine he broke the cork in half causing cork to get in the wine then proceeded to clumsily fill out glasses almost completely full with a comment of “what does wine even taste like?” The food was fantastic as usual but the service was terrible he didn’t come back between courses for at least 30-45 minutes and when we’d ask for something or he’d offer the dessert menu he’d disappear and not come back again for again about 20 minutes. Overall you shouldn’t have children serving alcohol, they should be more informed of the menu, and probably should check on guest a bit more often. Thanks. Our experience was claustrophobic, humid, hurried and way over-priced. It was far from relaxing or tasteful. Our server claimed to be the Manager and ended up over-stating being ‘sorry’ about certain situations multiple times. We questioned his true sincerely when he eventually never showed up at our table again and we had been transferred to a much younger bussboy-type fellow. All-in-all it was a tremendously hectic and tasteless dinner. Not a great experience this go around. Was given a table in back and it was very hot compared to other rooms in the building. Actually asked to go to another table, but wasn't given the opportunity. Overall service was good up until a bad piece of shrimp came out...we showed it to our server and all she said was "we will get that taken care of for you". Stayed on our plate until the cleared it off for desert. So we tried to eat desert but wasn't able to due to the heat. Have been to this location a handful of times but this experience could have been better. This was one of the worst Melting Pot experiences I have ever had. We were seated in an extremely hot section of the restaurant. Customers were fanning themselves due to the heat levels. Several times I had to step outside to cool off. The staff said this section was always warmer than the rest due to lack of circulation. We had a new server who was completely unprepared. She frequently had to 'ask a manager' and could not open a bottle of wine. She also provided incorrect cook times for all the food. The bathrooms were not well maintained. The floor was dirty and most of the stalls were without toilet paper. 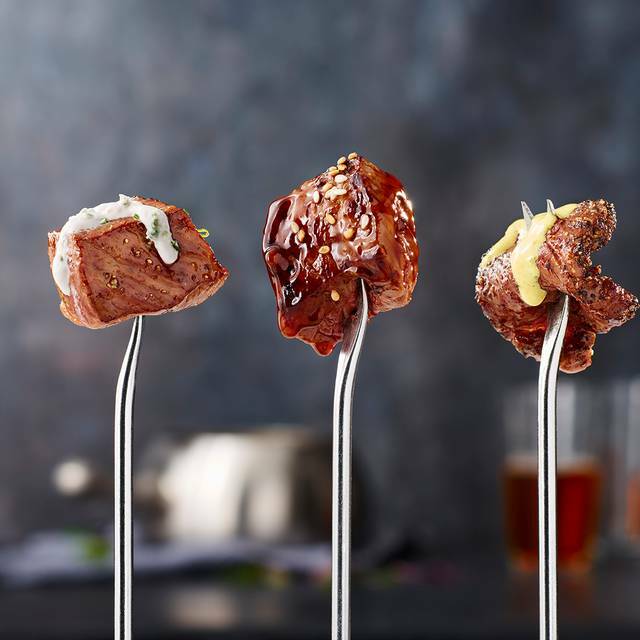 Lastly, not only had the portions sizes greatly decreased from my previous visit, the quality of meat also left something to be desired. While I applaud the addition of vegan items to the menu, this will probably be our last visit to this establishment. It's a shame as this had always been one of our most enjoyed restaurants. This place never fails to deliver. We were there on "National Cheese Fondue" day and it was incredibly busy, but they did a great job. I made a birthday reservation for 6:45 April 11. I went in a few minutes early spoke to the two hosts. They rudely said I’d have to wait at the bar because I’m early. No smiles at all! I was shocked! Sat at the bar a few minutes had a drink while waiting on my party. The bartender was very nice! My friends came to the bar to tell me our tables ready which I thought would be the hosts job. Then our server was not friendly at all! Didn’t mention my birthday and talked down to my daughter and her boyfriend. I e never had this bad of service here! We used to frequent Melting Pot before it was closed by the health dept last summer. This is our first dining experience since it has reopened. Our server had only been there three weeks but tried very hard to make our dining experience a good one. The menu had changed some...no upcharge for mojo cooking style for example. Our server being new she had no idea there used to be a charge for style of cooking. I ask as I didn't see it noted on the menu as being an upcharge. It was a nice surprise that it is now included in the cooking styles with no additional charge. May of the menu choices were the same which was nice as we have our favorites...Wisconsin cheddar, Flaming turtle, California salad, etc. My husband and I frequent The Melting Pot 3-4 times a year. I was excited to have a private booth for two with a curtain away from seeing others. The waiter was the worst we have ever had! He brought and made our cheese fondue and left to return the stairs. We realized we had no utensils to eat our fondue right after he turned and left and must not of heard my husband say "excuse me" when he was climbing the stairs. I was unable to find him and as a result had to go to the main desk in the front of the restaurant to ask for utensils. The cheese was outstanding, the apples were a hard and some of the bread was slightly dry. We weren't offered drink refills. The chocolate was excellent but it seems the plate of dippers get smaller every time we go. 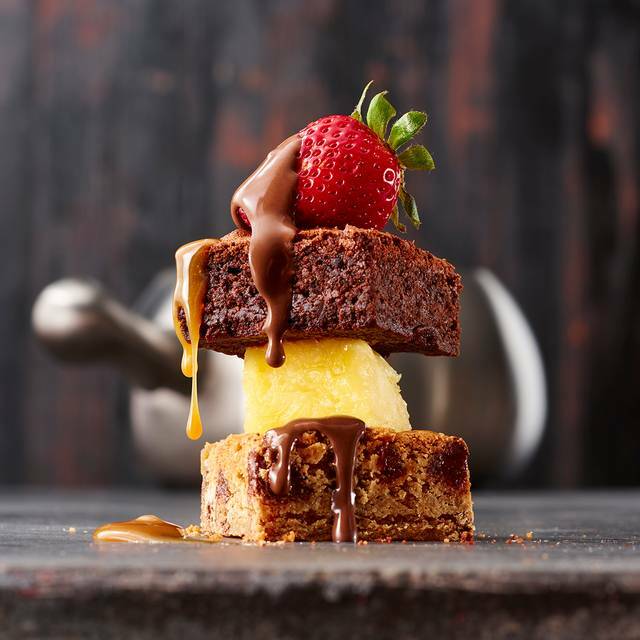 The dippers used to be on a square plate loaded with goodies but now it is on a small rectangular plate with a minimal amount. The bananas appeared to be coated in a glaze which isn't the way we have had them in the past. The waiter did offer more dippers as we still had half the chocolate left once the meager amount of dippers were exhausted but we didn't want to wait any longer. We will return to the Melting Pot next month for our anniversary and hope we have a better server, fresher bread and more dippers to begin with to go with the chocolate. Great as always. 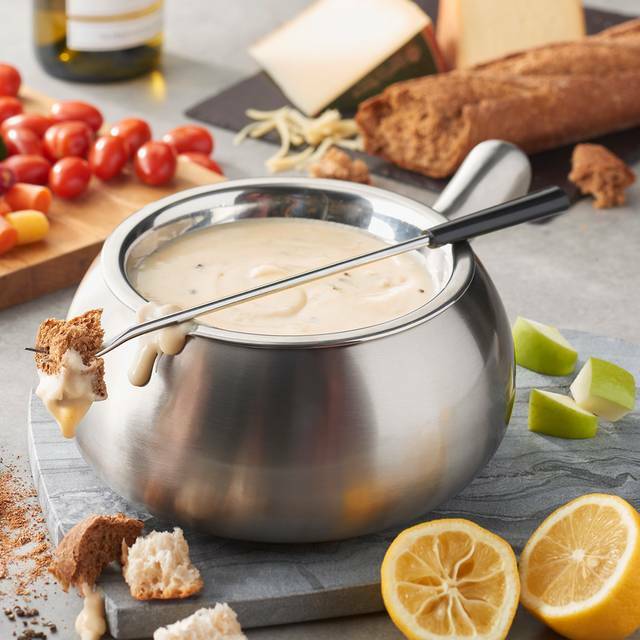 We went for 4-11 National Cheese Fondue Day to take advantage of the excellent prices and to try a couple of new things while the price was reduced. The extra sweets platter was amazing--caramel cheesecake was excellent and the creampuffs with the combination of cool cream and hot chocolate topping was absolutely amazing. Had to ask for two more so that my husband could try them, too. Yum. Also enjoyed half-priced wine and cocktails offered on Thursdays. Win-win!! Thanks, Teresa, for your excellent service. The absolute best desert, and food was very good. The cheese was excellent and it was an overall good experience. The food was good! The waiter barley checked in on us we were waiting for him to come back and give us more food for our fondue only came and talked to us twice the whole time and our table was close to kitchen so we could just here everyone talking. We went to celebrate our kids good grades and were overall disappointed with our experience. We made a reservation and arrived promptly at 6, seated at 6:15, finally saw a server at 6:30. Our cheese course started at 6:45ish, but they forgot to turn on the burner so it took forever. Salads were so small and about 4-5 bites. Finally started cooking dinner at 7:45. Our drinks were empty and service was very friendly but only came by every 15-20 minutes. We constantly had to ask for more water or wine!! We had to get up after waiting 30 minutes after our meal to order our chocolate course. The man who helped clear the table told us it was taking longer as our server was training someone. Why are we being punished for this? We finally walked out after 9pm!! We’ve been before and know it’s a longer meal, but not over 3 hours! And several tables were seated at 7 around us and left at 8:30 and had all 4 courses!! We didn’t get any apology or discount as they all knew we had been there forever and were frustrated. It’ll be a long time before I go back as paying $300 for dinner should be an enjoyable, wonderful experience. Very fun and perfect for our anniversary! This was our 1st time here and will definitely be back again for special occasion! We enjoyed the food and experience but the service was poor and the place a hot box. It is expensive for what you get. Plan to take your time eating there and dress for the heat. The server was terrible, the restaurant was a steam bath and miserable. We have been to multiple locations including this one before and have never had this issue. Very unimpressed. We attend The Melting Pot at least once a year. Our impression was that the classic cheese fondue was not as good as usual. We could not say exactly what had changed, but the taste was not quite right. Our server was new and started out great! As he get busier he kind of forgot about us. The area we were sat in was very stuffy. Everyone at our table was sweating and very uncomfortable by the desert course that we couldn't finish and just wanted to leave. Was a long night. Got there at 6:30 but didn’t leave until after 9:00. Food was good but our service lacked a bit. Other servers seemed to be very attentive. Found a broken piece of glass on our table but I found it before my son did. Overall it was an okay experience, not great. This place has a variety of options for fondue. Our server was pleasant and knowledgeable. We had the 4 course meal I found that includes a choice of cheese fondue served with vegetables and pieces of bread, a salad, a choice of entrees, and finally a dessert fondue served with fruits and other assorted items for dipping. The atmosphere is cozy. Be aware though - I found it a little pricey for what you get, especially since you cook your own food. But I would still recommend it, especially for special occasions. We did the three-course meal which included cheese fondue, a broth, and chocolate fondue. The cheese and chocolate were really good, but I didn't care for the broth. The service was amazing. The food was amazing but our reservation was at 6:45 and didn’t get say for 20 minutes after that. Finally when we did get seated our server must have forgotten about us because nobody came to the table for 15 minutes. I had to go to the bar and ask for a server. To follow that up she only came to the table twice and we had no drinks for the whole meal. Tim the bartender made our experience great. It was a lot of money for a dinner to have such bad service from a server that kinda disappointed me because my wife and I only get a date night maybe twice a year. We have two kids and dates are slim. I was really disappointed with the service. It was my birthday and I had a coupon for the chocolate strawberries. I requested them, but never got them. I even mentioned it to the server and she forgot. By the end of the meal, we were so tired of waiting on things (dessert, drink refills, the check etc.) that we didn’t even want to bother again. Having been a server, i understand things get crazy, but it wasn’t even super busy yet. I wish I could have better things to say, but to me, service is a big part of eating out. Our server, Frank, was great! Waitress was very friendly and easy to talk to. Time between courses was slow. Music playlist was great and food was excellent. 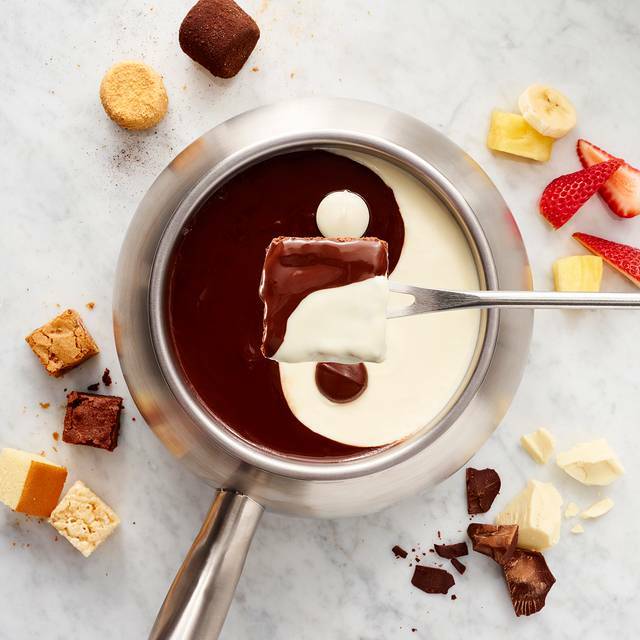 I recommend the fondue experience for two to four people. There were six in our group and it got confusing and the booth was too small to easily reach the food items. We liked the good quality of the food. The girls at the front desk were really rude when we showed up early for our reservations at 715 they told us we will not be seated until our entire party was there which they were not going to show up for an additional 15 mins. They didn’t seat us until 815 a whole hour after. Our waiter was amazing but the host ruined our experience. I could have spent my $160 elsewhere. Our family has eaten at Melting Pot in Kansas City several times. We were so disappointed with the service last weekend. We sat at the table for 15-20 minutes and still hadn’t seen our waitress. We also had long gaps between the courses and the meal took 3 1/2 hours for five people. We had to ask the hostess to find our waitress to get our bill. The food quality was good as usual but definitely not worth the bad experience. We got to the restaurant 15 minutes early. Was seated on time and given a high chair for our son. We didn’t have any water or any server. The party seated after us was given water, had their order taken. After 10 minutes we talked to the hostess and told her we have not been served. She asked who the server was and we told her again we have not been served. She said she would get on it. 5 more minutes pass and another party is sat in our area and they have water right away and their server is getting drinks they ordered. Another 5 minutes pass and we haven’t even been given water. We were seated for 20 minutes by this point and told the manager we were leaving. He said he could get on the server but didn’t seem to care much. We left 20 minutes after being seated without even receiving WATER. It was a little warm in our section but everything else was great. I have a reservation for 5:30. Numerous people were seated before I was and we eventually left because we had already waited for 20 minutes. One of the staff members asked who was next and the host replied "I don't know, but they have a resevation for 5:30"
Temperature was very warm, stagnant air and had funky smell? Food was ok..dessert was great! Meat was ok salad was kinda lame..cheese was ok..
Had to ask to get chocolate. Watched one table walk out. And other sit for 15 mins. The food was okay except it’s basically boiled meat. The staff is fantastic. It’s something to do once, but we won’t be back.